I bicycled 70 miles this week. That’s nothing for some people. Some people do that in a day. But I am no longer a long-distance rider, as I was when, bored and anxious about turning 30, I pedaled with my athletic husband on long camping trips. (It was so tiring I crashed in the tent at 6 p.m.) I am slow, but I have excellent endurance, and I still bicycle for transportation. 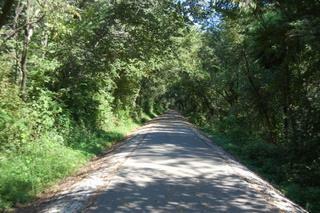 Today we rode 27 miles on the Chichaqua Valley Trail, a 20-mile rail-t0-trail between Bondurant and Baxter, Iowa. We started in Valeria (population: 57), a tiny settlement 13.5 miles from Baxter. This used to be one of our favorite trails, so lovely and scenic, through woods, prairie, wetlands, and farmland, but in 2011 flooding destroyed some bridges and washed out 12 sections from the trail. It has never been quite the same. It cost nearly a million dollars to repair, and they had trouble getting the money from FEMA. The bridges are rebuilt, and the trail is still a very nice ride, but the pavement could use some work. The trail also needs some good PR. Take the five-mile section between Mingo (population: 300) and Ira (population: 58): it is now mainly gravel, with a few strips of rough pebbles molded into the tar (cheap asphalt?). It is very difficult to ride on gravel. Fortunately, the rest of the trail is asphalt. Ira tries to be welcoming, though: in a picnic shelter, there is a Free LIttle Library, a tiny freezer turned into a bookcase. Open the door, and you find mysteries and science fiction. I was so surprised! The trail from Ira to Baxter (population: 1,096) was as beautiful as we remembered it: a long, but not steep, hill, everything very green, corn and soybeans just beginning to grow, some scrubby trees, lots of cows. Parts of the trail are very pretty. If you start in Bondurant, you glide down a two- or three-mile hill in the woods. Of course then you have to go back uphill. We got soaked in the rain coming back from Baxter, but it wasn’t a long downpour, thank God. Our clothes dried by the time we got back to Valeria. We saw few bicyclists. Perhaps they got out of the habit of riding the Chichaqua during the 16 months it took to repair it after the flood. Perhaps they’re on the High Trestle Trail, with the lit-up pedestrian bridge, not to mention the Flat Tyre Lounge and restaurants along the trail at Madrid. This entry was tagged bicycling, Chichaqua Valley Trail. Bookmark the permalink. ← The Future of Self-Publishing: I Double-Dare Ya! Yes, Ellen, there are walkers on these trails, too. It is good to get away once in a while. I know there are great trails in Virginia and Maryland, too. And we also see adults riding adult three-wheelers (trikes? ), so if you can’t balance, that could be fun.